Thanks to Laurie C., Stefani G., Carlos C., Sarah M., Amanda L., Amy L., & Christina C. for lending an extra hand. …Also, Micky/Minnie's third hand. . "Hi, Kids!" That's some goiter Snow White has - I've just never seen one of the *back* of the neck! Why does hermaphrodite Min-ckey have three hands????? 1) The baby is outside the cake. Everyone knows any tot old enough to eat cake would be right in the middle of it, and wearing most of it. 2) That's goal tending! (And Hulk has six fingers on his right hand. Someone is looking for him). 3) The problem here is the shoulder pads. What a fashion faux pas. 4) A baker's dozen isn't what it used to be. Either that, or it's cupcake gremlins. 5) The bakery obviously ran out of icing and the baker decorated with silly string. It better come with a warning label that it's not edible, or I smell a lawsuit. 6) Plainly, this cake is just a real drag. And here I was focused on counting green fingers on Colonel's cake.. Bad me. And here I thought that the issue with the 2nd one is that the Hulk is clearly goaltending, and the basket shouldn't count. I’m having a crappy day and this SERIOUSLY helped, bonus I’m also no longer craving cake. How many fingers does The Incredible Hulk have, anyway? Someone call Inigo Montoya. The hulk killed his father. Help out this old lady, guys! JHAGICYMI? I understand the ICYMI part, but JHAG? I am clueless! Oh, and these cakes are, uniformly, awful! But that's true every weekday, isn't it though? Mickey also has an extra floaty magic hand. And, Minnie Mickie has THREE hands! 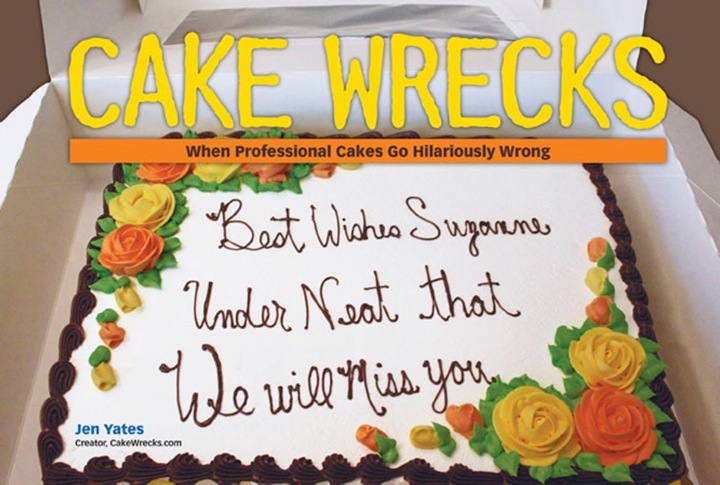 Way to go cake wreckabakers! @Mamahen, you just made my day with the Princess Bride reference! Also, I missed the fact that Hulk had six fingers until I read the comments, and, like @EA, I thought the problem was that he was goaltending. I'm still not sure I get the prob with the first one -- is it that, if a child is 3, he/she is a toddler and no longer a baby? It's 3:15 p.m. here and, clearly, I STILL haven't had enough coffee! OMGOMGOMG!!! The perfect!!! icing:cake ratio has finally been achieved!!! Laura47, it stands for "John's Helpful Answer Guide." Laura47: JHAGICYMI = John's Helpful Answer Guide In Case You Missed It. Snow White looks like she saw her reflection in the mirror and couldn't decide between horrified or crying lol poor Snow. Caleb can't read, but he can talk, and boy, can he throw a tantrum. Just wait until some well-meaning aunt reads out his cake to him: "Look, Caleb! B-A-B-Y spells 'baby'!" Cue "I'm not a BABY!" and the cake hitting the floor. John, thank you SO much for the "bald cupcake" hint. Very glad I wasn't sipping a beverage! Is it actually goaltending if, due to the ball being bigger than the basket, the shot was clearly made from underneath? This isn't a problem that comes up much in normal basketball. Maybe the Hulk is just trying to get it out of the ring, because it is stuck.